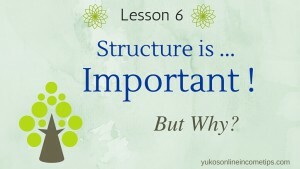 Today’s lesson covers the foundation of your website that many people overlook: the structure. First and foremost, you must have the framework in place for your website. Set your vision early on. No one would start building a house without a blueprint of the layout that is based on architectural logics, right? It must be the same for a website. Of course, you don’t need to worry about this if you are going to write blogs just for fun. You can write whatever you want for the topics you feel like talking about. But as long as a website is your business, not a hobby, you cannot randomly select topics and throw them onto your website. It has to be done with a structure and clear purpose in mind. Sounds Like Quite a Task… Do I Really Have to Do It? YES, and don’t feel bad as you are not the only one who wishes to avoid this step. In fact, many new website owners tend to skip this crucial planning process, and I admit I was one of those people myself! With my very first website, I didn’t take the time to structure my site and jumped into writing contents. Do you know what happened? My topics were all over the place, and they were just listed chronologically in the blog roll. I could find any article easily because I wrote them and knew where they were, but how on earth would a new visitor can find posts that they need? By the time I realized the importance of organization, I had created over 20 blog posts. You can easily guess what I had to do then. I had to re-do the layout of my entire site! I even had to go back to old contents I wrote and tweak them as they didn’t have a place (category) to go. Boy, it was a pain. Well, we all learn from mistakes and because of the experience, I can confidently give you this advice: Plan the structure of your site first. Before you proceed, please be sure to read through our previous lessons. This is Lesson 6 of this “Online Income 101” series. Ok, where do we start? Let’s do some research first and plan our site structure. Do some research on other sites within your niche. Please know that the purpose here is not copying, but taking influence and ideas from other websites out there. Google search under the search term, meaning your website title in this particular instance. I’ll type in “pure pink salt” in the Google search bar. And this is the result I got. 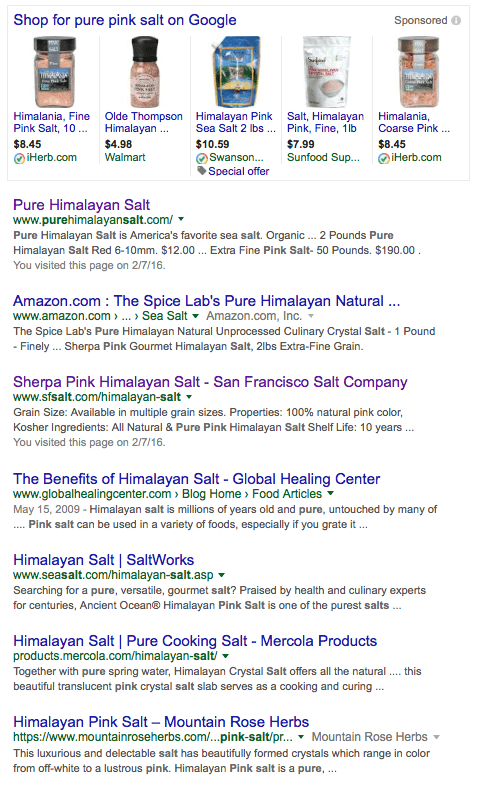 Google gave me these websites on its first page, which means Google approved these sites as relevant to the term “pure pink salt” and they offer high-quality information for searchers. We will have lots to learn from these sites. Now visit a few sites (at least three) from the Google search results and see how those websites are organized. Here the tip is to focus on those sites run by individual affiliate marketers rather than by established companies with big names. For example, if your niche is traveling in India, don’t go to sites such as TripAdvisor.com or ones run by tour agencies. Avoid sites that cover too broad topics and aim at ones on narrowed-down, specific topics. I’ll explain with my example. My search results brought out this one website that covers overall “pure” way of living. It covers topics from herbs & spices, aroma oils to natural cosmetics, and Himalayan salt was just one of those categories. This is too broad. Apparently, a company that sells natural products owns the site, and I wouldn’t get much insights or ideas from a site like this. A site that would benefit the framework of my website is like this one below. It’s specifically about Himalayan salt alone, and their menu bar tells me how the site is structured. I visited a few more sites and got a rough idea as to what topics I would want to share in my new website about Himalayan Pink Salt. From here, I will touch base with why site structure is important and what elements you need to pay attention to when it comes to website organization. But let me stress this once again, don’t skip this planning phase. Have the structure in place first. I’ll discuss more on SEO in future lessons (meanwhile, you can read this blog) but in short, it means the search engines (such as Google) evaluate your website and determine its high quality, hence granting your site with higher rankings in Google search results. Believe it or not, if humans feel your website is well structured and easy to navigate, web crawlers (Googlebot) feel the same way. Web crawlers periodically crawl your website to access content. The goal is for Google to evaluate the pages you created and this determines how they rank your page in their search results. A well-structured website makes it easy for Googlebot to navigate, index, and find all of your pages, meaning it helps Google to understand your site better. As a result, your website has better chances of getting ranked. Higher rankings mean more relevant traffic (visitors) to your website. The more traffic, the more chances of revenue. So, don’t underestimate the power of site structure. Keep it logical and easy to navigate. Good user experiences are fundamental to your online success in terms for both human visitors and SEO. Now that you understand the importance of organization, let’s learn how to best construct it. What’s the Best Website Structure? Do not make it too deep, keep it flat. What I mean by this is to not make your articles (pages/posts) 3 or 4 clicks away from the homepage. Make it super easy for visitors to find the exact page they are looking for! Below is the diagram of a generalized site structure. It’s quite flat (only 3 tiers), and will be easy to navigate for viewers and easy for us to build upon. Particularly for the very first niche website you develop, I recommend to keep the layout simple. 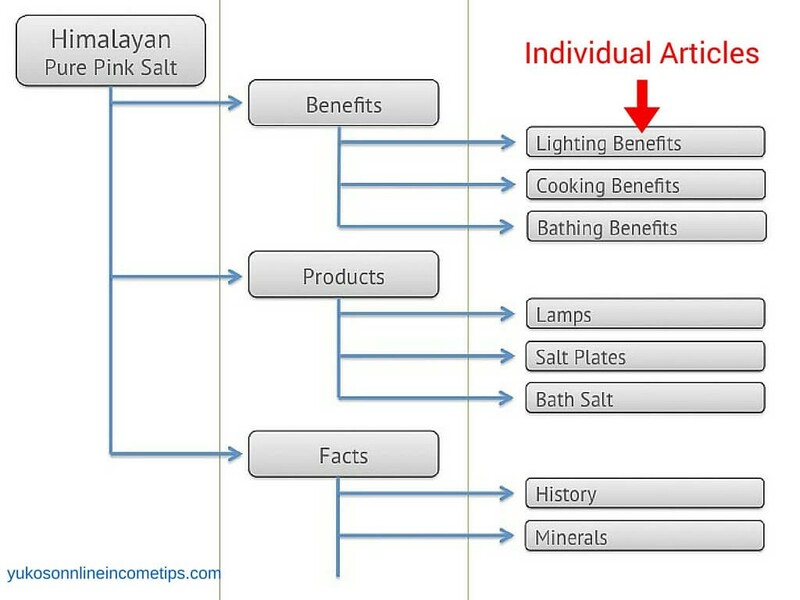 If I apply the layout above to my website, “Pure Pink Salt,” it will look something like this. I came up with those main Categories (on the 2nd tier in the diagram) through the research we performed earlier. Again, the key here is to not make it complex. The main categories may increase as you develop the site, but I recommend to keep it less than seven or eight. You don’t want too many main categories. 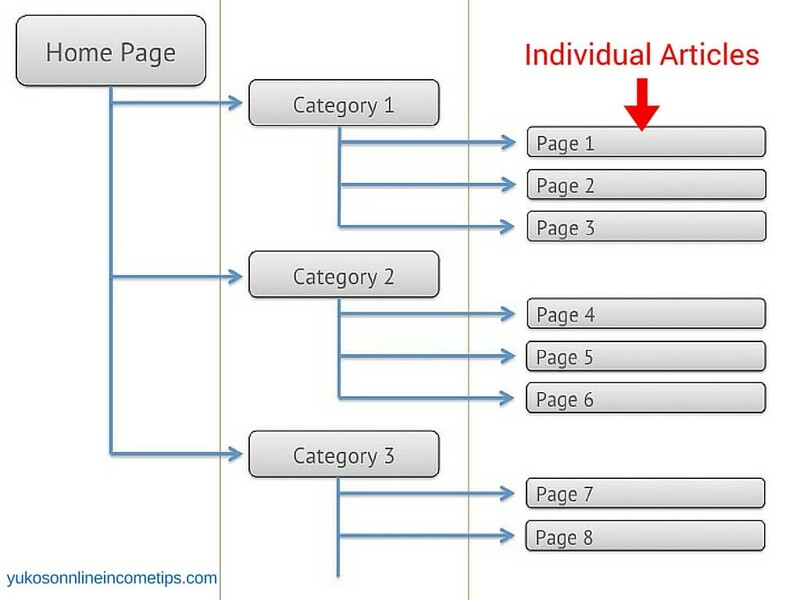 Looking at the diagram should give you good ideas as to what you want to cover in each post/page. This process immensely helps you come up with what to write for your website. Also, each content you create will always have a place to go and be easily discovered by both visitors and Googlebot. 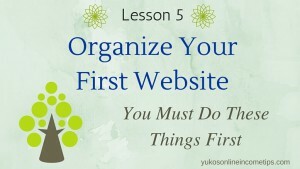 The last part of this lesson is to actually add the categories you have chosen to your website. Even though you don’t yet have any content (blog posts) to place under those categories, that’ ok. Let’s have them in place so that each post you write will have a category to belong to. I added three categories to my new website. Benefits, Products, and Facts. The Blueprint is Set… Now It’s Time to Write! You have learned how to structure a website layout and your new site is getting in a good shape. Great job! 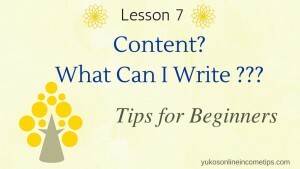 In the next lesson, we are finally going to start writing content relevant to your niche. I will share what aspects you have to pay attention to when you write an article. Your content is the core of your business, and from here your website is truly going to grow! Be the first to comment on "How to Structure a Website Layout – Beginner’s Guide"